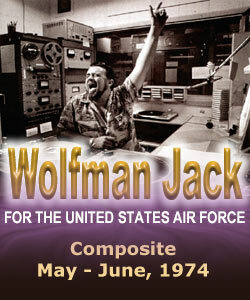 Our thanks to Jack McFarland for these recordings of The Wolfman Jack Show produced for The United States Air Force. REELRADIO combined four Wolfman Jack USAF features produced for May and June of 1974, and that's what you'll hear, here. Some great R&B mixed with pop hits and oldies of the moment, PLUS exceptional fidelity at points. What better treat for Halloween 2006? Music licensing and performance fees for every song paid by tax-deductible contributions to REELRADIO, Inc. We welcome your support. There are more exhibits in this Golden Gift Collection from Jack McFarland. Reel Top 40 Radio Repository ©1996-2006 REELRADIO INC.